NicStick is another quality electronic cigarette brand. The NicStick comes packaged as three piece tank style setup. NicStick gives users a more full flavoured experience. It is for users that like the feel of the vapour as it hits your throat. It seems to give an authentic smoking experience. 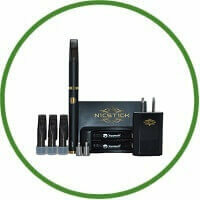 NicStick is another quality electronic cigarette brand. The NicStick comes packaged as three piece tank style setup. This is slightly different than other e-cigarettes in that they are mostly two pieces. Unlike the three piece design, the two pieces has a built-in atomizer. The two piece design is slightly easier to use, but it does not allow the user to remove the filter. The filter is built in to each cartridge. NicStick has the three piece tank style which allows users to be free of the filter. This style may work better for someone looking for that real cigarette feel with a more robust flavour. NicStick gives users a more full flavoured experience. It is for users that like the feel of the vapour as it hits your throat. It seems to give an authentic smoking experience. The packages are available in a variety of styles and flavours. They are offered in a gift pack for special occasions or in the traditional packaging. The company does a good job of making the NicStick look stylish and attractive. There is a range of flavours to mimic each users taste. They are offered in tobacco, menthol, blueberry, cappuccino, vanilla, horsepower, coffee, and Turkish blend. Users are given the choice of e-liquids to fill themselves or prefilled cartridges. There is an option to purchase empty cartridges for the user who wants to fill them on their own. This would give the user the option to customize flavours, as well. NicStick offers less flavour than other e-cigarette companies, but the flavours they have seem to all be well researched. What About The Design Of NicStick? The design of NicStick seems to be one of taste. The cigarette is somewhat of a designer accessory as opposed to just a cigarette. They have done a nice job of making a very relevant design and offer a personal carrying case at a reasonable price. The packaging looks quite high end. 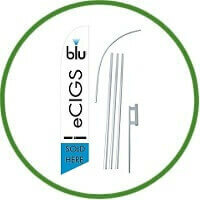 They also offer a Sirius line that includes a cartomizer type e-cigarette. The customer service at NicStick seems to be better than average. Their online presence makes it known that they are interested in what their customers have to say about NicStick. The site has several polls and requests feedback from its users. They also offer a 30-day warranty on most of their products. It is easy to contact them as they give lots of options. Customers can opt to call a toll-free number, email, social media, or online chat. This offers customers immediate answers to whatever issues they may be having. NicStick has several positive aspects like its great taste, ability to customize, awesome customer service and online presence, and an appealing design. A few negatives are less flavour than other companies, and may take some practice putting it together.